US equity markets recorded another round of sizeable gains on Friday, with the likes of the S&P 500 (+1.32%) and the Dow Jones (+1.38%) establishing further distance above their respective 50-day moving averages. Meanwhile, safe-haven assets such as the Japanese yen and gold surrendered ground. The moves were fueled by fresh reports that China offered to boost its imports of US goods by a combined $1 trillion over the next six years, to eliminate the bilateral trade deficit between the two economies by 2024. Markets interpreted this as yet another sign that a trade deal is inching closer, particularly since such a move would simultaneously appease President Trump’s deficit concerns and allow him to present his voting base with a “victory” ahead of the 2020 elections. Yet, sentiment has turned around a little on Monday, with futures tracking the major US stock indices pointing to a negative open, following overnight news that the US Treasury saw little progress on intellectual property issues during these talks. GDP data out of China earlier showing the weakest growth in a decade may have contributed too. The world’s most trade currency pair drifted lower on Friday as the US dollar received support from an uptick in US bond yields, though the pair is recovering those losses today. The technical picture of euro/dollar is particularly interesting, as the next few sessions will determine whether the bias is to the upside, or neutral. Specifically, the pair seems ready to test an uptrend line drawn from the lows of November. A decisive break below it would mark a lower low on the daily chart, signifying that the trend is sideways, whereas a rebound would keep the structure of higher lows intact, painting a positive picture. In terms of fundamental catalysts that could cause such a break, or rebound, the most important one will probably be the ECB meeting on Thursday. The latest comments by ECB officials suggest a clear shift in tone towards a more cautious direction, so it will be interesting to see to what extent this is reflected at the actual meeting. Eurozone’s preliminary PMIs due on Thursday or a potential solution to the US government shutdown could also prove crucial for euro/dollar’s forthcoming direction. 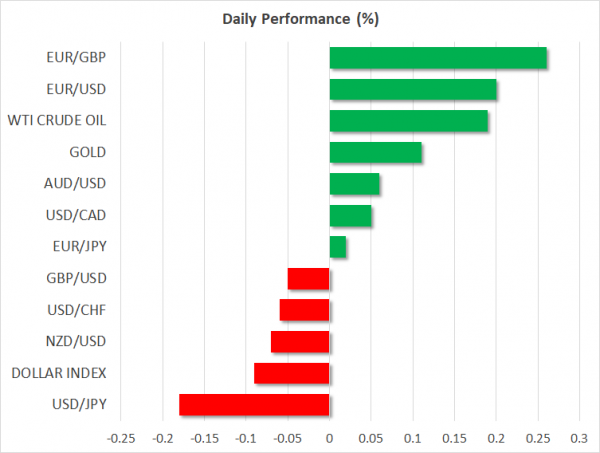 The British pound was the worst performer among its G10 peers on Friday and is also on the back foot today, as speculators likely cut some of their exposure to the British currency ahead of a key Brexit risk event today. Following the overwhelming rejection of the government’s Brexit deal last week, the Prime Minister is expected to present an alternative plan to UK lawmakers later today on how she intends to proceed with the exit process. Admittedly though, it’s difficult to envision a scenario under which she manages to find a majority in the Commons for any plan she proposes, so political uncertainty – and hence volatility in the pound – are set to remain elevated. Overall, while recent moves by Parliament to ensure a no-deal outcome is avoided are keeping a floor under sterling, for the next leg higher to materialize, it may require a major positive development, such as Article 50 being extended.